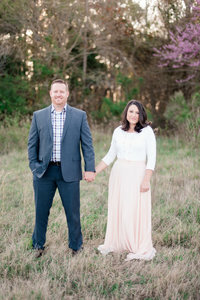 I am so in love with this Alabama wedding and even more so this couple and their families! This past Saturday we had the honor of celebrating with Dalton & Ashlea as they became in husband and wife in the good ole sweet home Alabama. We met Ashlea and her family about 6 years ago. Her dad at the time was our Pastor and we immediately loved their family. I have never met people so full of joy and love for one another. Luke & absolutely adore them! When Ashlea got engaged, I will be honest. I didn’t think any guy would fill the shoes to join her amazing family. And then I met Dalton. They had drove up to Virginia for their engagement session and I was just blown away about how amazing this guy is. He loves and honors Ashlea and together they truly bring out the best in each other. She had found the one and him and his family were the perfect addition to hers. On the day of the wedding a big storm rolled through. Funny enough it rained on their engagement session as well and yet it was absolutely perfect. When the rain finally eased up Ashlea’s dad began to walk her down the aisle. The rain lightly sprinkled as they walked. It was as if heaven felt the weight her dad was feeling as he walked with his daughter to give her away. As the ceremony progressed it was absolutely beautiful. Incredibly amazing to be apart of and capture. Towards the end of the ceremony, the clouds rolled away and the sun peeked through. Again, heaven was taking part in their perfectly beautiful day. Even a rainbow made an appearance. Ashlea was absolutely breathtaking. Seriously, Alabama Wedding Magazine, if your reading this… She needs to make your next cover! I will admit, I am a big advocate of a First Look. By doing a first look, it frees up so much time after the ceremony for other things. Dalton & Ashlea decided not to do a First Look. However, Ashlea really worked with us with timeline and despite not doing bride and groom portraits before the ceremony we still were able to have plenty of time afterwards with the newlyweds. Instead of doing a First Look, Dalton and Ashlea wanted to pray with one another behind a door. They also wanted to exchange letters to one another and read them at that time. Sometimes, I feel like I am invading private spaces especially at times like this. And then, we get images like the ones below and I know that it is totally worth it because these are the pictures will take that couple back to that very moment. The moments that were most intimate and meaningful. So even though there was no First Look, this moment, just the two of them right before getting married was one of my very favorites. Dalton and Ashlea, Thank-you. Thank-you for inviting us to Alabama to celebrate with you two. Thank-you for unashamedly worshiping God and giving him all the glory throughout your day. You two are so good together and it is such a joy to know you both! Luke and I both were crying behind our cameras! Such a beautiful moment! I love the picture below. Captured below are the ones who led us in worship and to the right Ashlea’s brother and new husband in the background. To See their engagement visit Here!